The first minutes and hours after a baby is born are precious - it is the chance for a mother to bond with her child after months of expectation and the pressure of giving birth. Now midwives in Kent are studying the use of a device which it is claimed can help babies born prematurely to put on weight and develop far quicker than if they were to stay in an incubator. 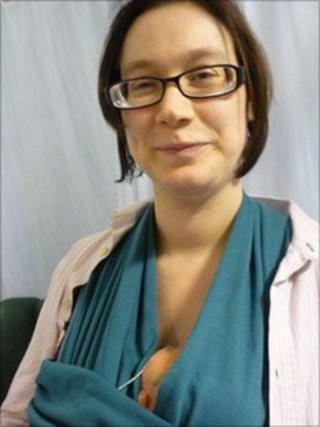 A simple sling, used to cradle the child as close to the mother's skin as possible, has been tested at the Pembury maternity unit near Tunbridge Wells since November. About 90 mothers have made use of the sling, which is part of a method called Kangaroo Care, and the progress of their children has been monitored under a study looking at how particularly premature babies develop. The study will conclude next month. So far the signs are that the scheme is bringing beneficial results. Humphrey Hamilton was born on 28 December, six weeks before he was due. His mother Carianne elected to use the sling in those early weeks. "It was great to feel so close to him," she said. "When it was offered to me to try I jumped at the chance." Jean Meadows, a consultant midwife at Maidstone and Tunbridge Wells NHS Trust, said: "Normally we'd expect a child like Humphrey to spend several weeks with us... he went home within days." It is also claimed that the sling encourages mothers to continue breastfeeding. "There's been a lot of research elsewhere into Kangaroo Care for premature babies which shows that it can lead to a shorter hospital stay, more successful breastfeeding, less crying and more quiet sleep," consultant midwife Sarah Gregson said. The hospital has established links with Craftaid, a Fairtrade charity based in Mauritius which makes the slings. The plan now is that the Maidstone trust will act as a hub for the rest of the NHS and be able to commission more of the slings from the charity.